There have been many companies that have launched and succeeded (or failed) who would have dreamed of their company name or product becoming a commonly used noun, or even better, a verb. People refer to facial tissues as Kleenex, soda pop as Coke and, within the past decade, taken on Google as a verb meaning “to search.” Google can have a hard time coming to grips with the use of their product as a verb – as shown in this Google blog entry from 2006 – but becoming the next verb is the Taj Mahal and driving force within many start-ups. The problem is, most don’t realize the factors necessary to make the transition from Idea to Verb a reality. In the case of Google, they came to be when there were numerous search engines and within a few years, the others had fallen by the wayside due to Google’s solid product. Bing is now the only one close and a lot of the reasons for their still being around is marketing and integration with the operating system that is most prevalent around the world. As seen in the blog entry, Google itself was not so keen on becoming a verb unless it was specifically about the use of the product itself. 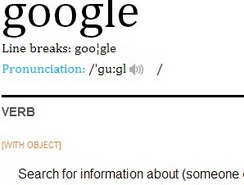 Either way, pre-verb, the seemingly most important thing to Google was to become the single best service available and that is the thing that most people who strive to be a verb overlook. Striving to be included in Websters or some other dictionary means that you’re missing the point. Certainly, such an inclusion would mean you’ve done something right, but it shouldn’t be the goal. Whenever a client asks for this, I have the same response as we’ve all had when asked by someone to create something viral. In both cases, the importance should be placed on creating the best product possible and hoping that the winds blow the right way to create the perfect storm that allows your creation to become viral – or a verb. If the expectation that largess and notoriety will come from a strong marketing or publicity campaign, then there must be consideration for the fact that audiences have changed over the years. The main change in the audience is that they expect delivery on promise. If they don’t get it, they will run. If a company pushes to become anything more than a solid product, people will run. Much of the navigation between the time of the idea and the possibility of becoming a verb requires a lot of smart, strategic thinking and damn fine product development. Without those actions, you’re destined to be lost in space.